The Canon EF 200mm f/2.8L II USM Lens is a fast, high quality 200mm telephoto lens available for a very nice price. If you have used the renowned Canon EF 135mm f/2.0L USM Lens, you have a good idea of what the Canon EF 200mm f/2.8L II USM Lens feels like. These lenses share a very similar and excellent build quality - Both lenses handle very well. The size of the 200 is slightly larger (3.3" x 5.4" / 83.2mm x 136.2mm) and the weight slightly heavier (1.7 lb, 765g) than that of the 135 (see picture below). 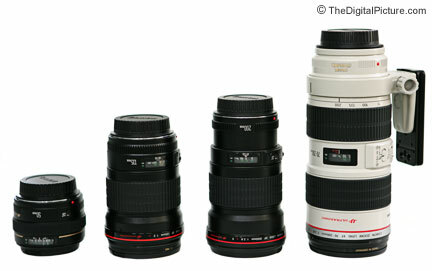 Pictured above from left to right are the Canon EF 50mm f/1.4 USM Lens, Canon EF 135mm f/2.0L USM Lens, Canon 200mm f/2.8L II USM Lens and Canon EF 70-200mm f/2.8L IS USM Lens. Image quality from the Canon EF 200mm f/2.8L II USM Lens is excellent. Wide open (f/2.8) sharpness is excellent from corner to corner and only slight improvement can be seen through f/5.6. Contrast and colors are excellent. The very minor pincushion distortion present will be noticeable in very few shots. Some light fall off can be seen in full frame corners at f/2.8, but stopping down quickly eliminates this. Flare is very well controlled. Bokeh (foreground/background blur quality) is nice - An 8-blade aperture contributes to this result. The 200mm focal length combined with an f/2.8 aperture helps create a diffuse background blur when the subject is relatively close. The Canon EF 200mm f/2.8L II USM Lens focuses very quickly, quietly and accurately using Ring USM (Ultrasonic Motor). Like the 135 f/2 L, the 200 f/2.8L uses a rear-focusing design that is completely internal - the lens does not extend. FTM (Full Time Manual) focusing is enabled. A focus limiting switch enables close distance focusing to be limited to 3.5m for improved performance. Fast-action sports are not be a problem subject for this 200. In fact, sports photography is one of the best uses for this lens. Although an f/2.8 aperture can be marginal indoors, this lens sees a decent amount of use at indoor sporting events. With a mediocre minimum focus distance of 4.9' (1.5m), the 200 f/2.8L II is not going to be confused with a macro lens. The native .16x maximum magnification can be extended to .23x and .32x with 12mm and 25mm Extension Tubes respectively. 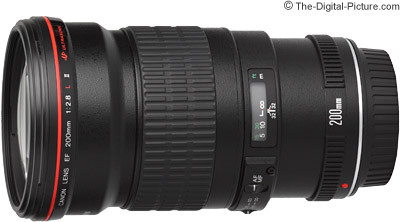 Better magnification will be found with the Canon 500D Close-up lens or with an extender. The 200 f/2.8L II is compatible with both the Canon Extender 1.4x and the Canon Extender 2x. All Canon EOS bodies retain AF functionality with even the 2x attached to this lens. Performance with the 1.4x attached is very good. Sharpness in full frame corners suffers somewhat, barrel distortion is added and CA is noticeably increased. Wide open results with the 2x in place are soft - Stopping down to f/8 restores good sharpness. CA is increased and contrast is reduced. The 200 f/2.8L II ships with a Canon ET-83BII lens hood and a Canon LP1222 Lens Pouch. Canon's lens hoods are not usually as small as the hoods included with third party-equivalent lenses, but they generally allow your fingers to access the lens cap or a CP filter. I'll take the larger size for the convenience it provides. Version I of this lens had a built-in hood. This lens is not weather sealed. Like most of Canon's L primes, the 200 f/2.8L accepts a 72mm filter. The Canon Tripod Mount Ring "A"(B) for 200/2.8 L II is an optional accessory. Tripod rings are really nice to have (especially if using the lens on a monopod without a head or when using certain flash brackets), but if you are using a decent tripod head, you probably don't need this tripod ring for stability reasons. I mentioned sports photography as one of the best uses for the 200 f/2.8L II. Other good subjects include people, places, things ... Almost any subject that invites some telephoto framing/compression can beautifully be captured by this lens. If you have the distance, the Canon EF 200mm f/2.8L II USM Lens makes a nice portrait lens. F/2.8 at 200mm can create a very nice and generally-desired background blur for portrait photography. The Canon EF 200mm f/2.8L II USM Lens lacks the versatility of a zoom, does not have IS and does not have a wider aperture than some of the zooms available with this focal length. These are the main three shortfalls of this lens - And for these reasons, I will usually use my Canon EF 70-200mm f/2.8L IS II USM Lens when I need the 200mm focal length. Canon's line of 70-200mm L lenses are excellent optically. These zooms will not beat the prime in optical quality, but they come very close. At most identical apertures, the newer 70-200mm f/2.8L IS II Lens is actually slightly sharper. The f/2.8 zoom lenses are much larger, heavier and more obvious when in use (the 200 f/2.8 II is currently Canon's longest focal length L lens that is black). Some of the zooms have IS and weather sealing advantages over the prime. If you require f/2.8 at 200 and can't afford the more versatile Canon EF 70-200mm f/2.8L USM Lens or the Canon EF 70-200mm f/2.8L IS II USM Lens, the Canon EF 200mm f/2.8L II USM Lens is the right choice. The Canon EF 70-200mm f/4.0L USM Lens is also more versatile (in mm options) and less expensive than the 200 f/2.8L II, but is not as fast (aperture). If you need only the 200mm focal length and have the funds (and can handle the larger size), the Canon EF 200mm f/2.0L IS USM Lens is perhaps the best lens Canon makes as of review time. It is amazing. If you need only the 200mm focal length, don't need IS or weather sealing and can't afford or don't want the 200 f/2L IS, your decision is easy. Buy the Canon EF 200mm f/2.8L II USM Lens. It is an excellent value.